Economical intelligence screening battery based on Thurstone's primary factors. Measurement of level and structure of intelligence; suitable for all relevant assessment purposes from the age of 13 years. The IBF tests are particularly useful as screening tools when a swift global overview of intelligence level is required. The intelligence profile can also be used as a preliminary to more detailed investigation of particular areas of ability. Main areas of application: education, further education and career choice; performance-related aptitude assessment, clinical psychology, educational psychology; work psychology, industrial, and organizational psychology. 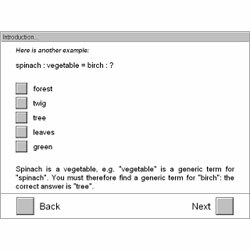 The test aims to provide a differentiated assessment of the main areas of ability which are hierarchically structured at a level of medium abstraction. Building on Thurstone's primary factors of intelligence (1938), this tool for analyzing intelligence structure assesses the following four ability dimensions: verbal intelligence (35 items), numerical intelligence (40 items), spatial visualization (17 items) and memory (20 items). There is a time limit for the completion of each group of items. Standardized instructions and practice items are presented before each group is worked through. The respondent selects the correct answer from a multiple choice range. Amendments can be made to individual answers within a task group, repeatedly if necessary. Within the permissible time limits it is possible to go back to any item in the group in order to change the answer. The results of the IBF are given in the form of z-transformed factor scores for the ability areas of verbal intelligence, numerical intelligence, spatial visualization and memory. An overall intelligence score is also provided, based on a hierarchical linear structural equation model. All test scores are compared with the norms and percentile rankings and T-scores are given. The test protocol indicates how the individual items were answered (correct, incorrect, amended, omitted) and how long the test took. Internal consistency (Cronbach's Alpha) for the individual areas of ability lies between r=0.84 (spatial visualization) and r=0.94 (numerical intelligence). For the test as a whole a value of r=0.95 was obtained. The test has been optimized to combine an economical test length with a very high degree of reliability. Studies show correlations with Raven's matrix tests APM (Raven, Raven & Court, 1998) and SPM (Raven, Raven & Court, 1979) of r=.30 to r=.41 (APM, N=237) and r=.42 to r=.52 (SPM, N= 256) for the item groups and r=.52 and r=.66 for the overall test score. Correlations with INKA (Heyde, 1995) are between r=.36 and r=.47, or r=.54 for the test as a whole (N=320). For Form S1 computer norms are available for 4771 individuals; these norms have also been separated according to age, education, and gender and are available for persons age 14 and up. In addition, for Form S2 norms for 5581 individuals aged 13 and over are available. Test form S1: approx. 45-65 minutes (actual test time). Test form S2: approx. 30-45 minutes (actual test time).